Come enjoy our contemporary service and wonderful praise and worship. Church service times 9:30am and 11:15am. Sanctuary reserved for silent prayer time. If you would like to come to church and pray silently in our sanctuary, please see Linda Phillips for more information. If you attend Solid Rock and have a child that is in middle school, we invite you to bring your child to our Forge Youth group. This is a wonderful group that spends time once a week in bible study and also having fun together. The kids go to different events throughout the year and serve the community. If you are interested in knowing more, please see our Forge Youth group servant leaders, Anthony Morreale and Alyssa Plank. Our high school group (The Torch) currently meets with our Forge Youth Group. If you are a Senior and attend Solid Rock, we invite you to attend our weekly Senior Saints bible study. The group meets every Friday morning from 10am-11am in the fellowship hall. Any question, please see our servant heads, Ron/Mary Jane Kaufman or Dianna Niosi. All men and young men are invited to join us for breakfast. There is always fun, food, and fellowship. The group meets at Bob Evan's Restaurant (unless otherwise posted), 3384 Waccamaw Blvd., Myrtle Beach, SC 29579. The meal is DUTCH (everyone is responsible for their own cost). Different speaker each month. Please see Dale Staley or John Jeffries if you have any questions. We want the thank you for attending short groups this season (February- March 2019). We invite you to attend our short group dinner. Your facilitators will be serving you dinner in the fellowship hall. We ask that only participants and facilitators that attended the short groups come. If you attend Solid Rock and are looking for a group for adults over 50, Solid Rockers group is the answer. This group meets once a month and there is always a great time. Pot luck dinner is every month- so bring a dish to share. There is fun, fellowship, and lots of food. Any questions, please see our servant heads, Ron and Mary Jane Kaufman. Always the second Friday of each month. Meets in fellowship hall. Everyone is invited to join us for this wonderful event. 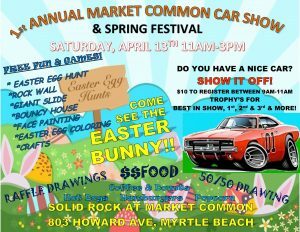 Car show registration is 9:30am-11am so be sure if you are entering a vehicle that you do so during that time frame. The Festival starts at 11am. Festival is 11am-3pm. 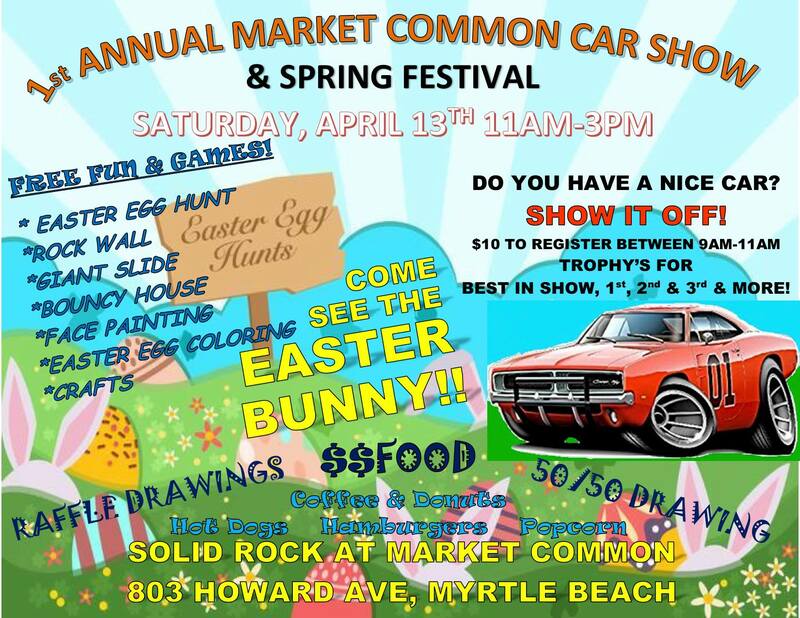 Egg hunt, rock wall, giant slide, bouncy house, face painting, Easter egg coloring, crafts, hot dogs, hamburgers, popcorn, 50/50, raffle drawing, trophies for car show, and much much more! Reserved for 3Cs: Couples Connecting in Christ. All couples that attend Solid Rock are invited whether they are married, engaged, or just dating. Fellowship and fun together once a month. Third Saturday of each month. 6:00-7:30pm in the Fellowship Hall. Any questions, please see Dale/Paula Staley or Jeff/Kristi Kipe. Join our Adult Sunday School class every Sunday morning. The class meets in the back fellowship hall room from 10:00am-10:45am. Attend Sunday School and then attend our 2nd church service. Any questions, please see Mary Jane Kaufman.